Cheyenne Mountain Entertainment, the long-suffering studio behind Stargate: Resistance and Stargate Worlds, has finally collapsed under the weight of its crushing debt, laying off all employees and ceasing all operations. The Cheyenne Mountain saga has been dragging on since 2008, when it was revealed that the studio's MMOG project Stargate Worlds was at risk of running out of money. The news didn't get any better when a lawsuit over unpaid bills was filed against the company in March 2009 or a few days later when Stargate SG-1 Executive Producer Brad Wright called the whole thing a waste. The studio was able to release Stargate: Resistance last month, a game which seemed to come from out of nowhere, but only a couple weeks later it declared Chapter 11 bankruptcy. Even so, it put on a brave face, stating that Chapter 11 "does not shut [Cheyenne Mountain] down or otherwise affect its daily operations." Unfortunately, CME's daily operations have now most definitely been affected: The studio has laid off all employees and ceased operations while it undergoes an evaluation by a court-appointed receiver. According to a statement made by the receiver, CME current has less than $10,000 in cash, while it faces up to nearly $20 million in debts, including $1.1 million in unpaid wages dating back to March 2009, state and federal taxes of $3 million and five lawsuits with an estimated potential liability of over $10 million. The studio was expected to begin vacating its building today; on top of everything else, it owes around $35,000 in back rent and the landlord indicated he would "lock the doors" at midnight on March 31. The company is also struggling with a dispute over management; Gary Whiting, the former CEO who was removed amid allegations of financial shenanigans, is contesting his dismissal, while someone named Dale Grabois is apparently claiming that he was appointed president of CME by Whiting. While awkward and potentially confusing for shareholders caught up in the mess, the receiver noted that it's not particularly relevant question. "It is a moot point at this particular point in time because the Receiver has been placed in control of CME and CMG's affairs," he said. Believe it or not, however, the news isn't all bad. Stargate: Resistance, the game CME did manage to ship, is now in the hands of a new operation called Fresh Start Studios, founded by CME shareholders who didn't want to see it go under. Fresh Start paid $100,000 for the game and is investing another $200,000 to cover expenses including payroll, rent and other costs. "They have taken this step in an effort to preserve the game and prevent it from going offline because they felt there was no other alternative," the receiver noted. "As represented to the Receiver, their sole intent was to preserve the game and prevent it from going offline due to lack of funding, employees leaving because they had not been paid, etc. The principals did not want to put additional money into CME or CMG because of the current shareholder litigation proceeding in Superior Court and the financial circumstances that exist." It's always sad to see a game studio come to grief and never more so than when it was working on a project with as much potential as Stargate: Worlds. 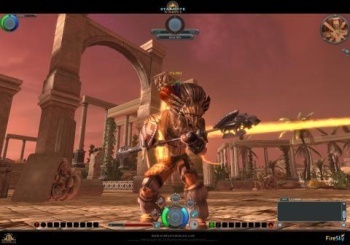 I don't think anybody expected it to dethrone World of Warcraft, but with a rich backstory and "anything goes" approach, a Stargate-based MMOG could have been a lot of fun. With luck, Stargate: Resistance will remain viable, but it looks like Stargate Worlds has finally breathed its last.